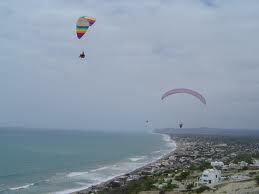 parish It is a tourist resort best known for free flight and paragliding enthusiasts. It is in the Valley of the River Portoviejo where walks can be for picturesque landscapes with observation of birds, especially herons Only 20 minutes from Portoviejo, is considered worldwide as one of the best places where you can practice sports such as paragliding and hang-gliding; each Tandem flight has a duration of 15 minutes. Its extensive beaches and sunny season days a taste give fullness to acquire an excellent Tan.